To survive the horror genre as a filmmaker these days, you need to have some sort of gimmick. When mere things that go bump in the night have run their course and don’t scare anymore, you need to spice it up. Luckily for actor and director John Krasinski, the gimmick is simple but effective: If you make a peep, the next sound you’ll hear is your death knell. In the thunderous A QUIET PLACE, a catastrophic global event has turned the world dark and silent. Humanity has been virtually wiped out by blind, demogorgon-looking monsters with a keen sense of hearing. That means if you step on a nail, knock over a lantern, or better yet, deliver a baby, you better hope you don’t let a noise slip. These creatures are all around and hunt like sharks. The film focuses, to great effect, on one family (Krasinski, Emily Blunt, Millicent Simmonds and Noah Jupe). Everything we learn about them is picked up by subtle visual cues, such as them laying down sand to eliminate noise, using cotton balls for board game pieces and painting floorboards to tiptoe around the creaks. They also cleverly communicate with lights and sign language. It’s clear Krasinski mapped the story out carefully with his co-writers, Bryan Woods and Scott Beck. There isn’t a stone they leave unturned. So, feel free to challenge its intellect. I don’t know that Krasinski could craft a more potent and near-perfect entry going forward in his filmmaking career. He masterfully weaves together intensity that’ll have your stomach in knots and stirring family drama that deserves awards attention. I can honestly say I’ve never had an experience where a horror movie sent my heart running and made me so emotional at the same time, but here I am, vulnerable and in awe of it. Extras: Three behind-the-scenes featurettes (a making of, sound and visual effects). With so many television shows out there, you have to put your ear to the ground, otherwise you’ll lose your head over the chase of a new good show. One series that has generated much excitement is HBO’s wildly original series BARRY (now available on Digital HD). 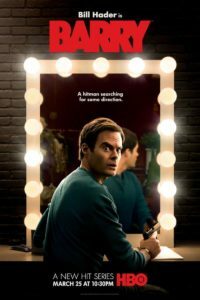 It may be difficult to picture funnyman Bill Hader playing a reserved hitman, but he pulls it off like he’s been doing it his whole career. Barry sees Hader’s titular low-key assassin character trying to locate an acting student who’s allegedly having an affair with the wife of a mobster. But once Barry is introduced to the world of performing on stage, he finds a new platform to express himself. In eight speedy episodes, you’ll laugh plenty (especially whenever Anthony Carrigan or Henry Winkler are on screen), but you may be surprised to see yourself returning more for the great character study. Barry’s plight to reinvent himself ramps it above most series of this year. The show drags in some areas, mostly in its final two episodes, but the last moments hit right on target and have you eager for more. Extras: A 2-to-3-minute inside look at each episode, a trailer and special interview segment. If you’ve seen the film’s trailer (as seen below), it has all the markings of a story you may be familiar with: A boy (Charlie Plummer), who wants a horse but can’t afford one, takes the horse before it ends up in the wrong hands, followed by all the trials and tribulations that result from that decision. Only those trials and tribulations aren’t the same as you’ve seen in more family-friendly movies. 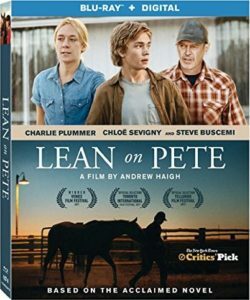 LEAN ON PETE is an oddly comforting and grueling experience. On one hand, the way the film is shot, with its long takes and wide shots to get a feel for the space and atmosphere, allows the viewer to exist in the story along with the characters. Everything unfolds in a manner that doesn’t feel broken up. It flows quite organically and doesn’t necessarily fit into the traditional American narrative, and that’s an admirable quality. Like the zombie genre, vampires also have been done every which way under the sun (or, moonlight in the case of a vampire). But 1995’s THE ADDICTION is about as inventive as you could ever sink your teeth into. 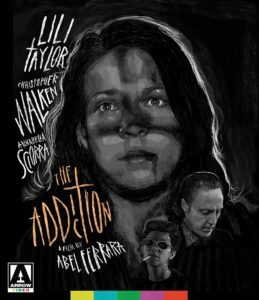 It stars Lili Taylor (THE CONJURING) as an philosophy student who has an encounter with a blood sucker and faces the nature of humanity and evil in a whole new light through her transformation into one. Dark, deep, sometimes blackly humorous, director Abel Ferrara (BAD LIEUTENANT) uses his vampiric story as an reflective essay on of the state of society — the way we feed off each other and become addicted to what’s not pure for the soul. Through its rich dialogue, beautiful black-and-white cinematography and casting (especially Christopher Walken as a sharp mysterious character), you’ll be seduced by its complexity. Extras: Arrow Video packages an immaculate collector’s edition of the film, stacked with special features that are just as fascinating as the film. It includes an audio commentary, a new documentary made by Ferrera, a new interview with Ferrera, an appreciation special with biographer Brad Stevens, an archival piece from the time of production, original trailer and reversible cover art. Some of my favorite sci-fi movies (COHERENCE and ANOTHER EARTH) come from filmmakers I’ve never heard of and don’t have blockbuster-sized budgets. This allows me to approach the material without preconceived notions and it allows the filmmaker to find ways to focus more on character over spectacle. But after seeing THE ENDLESS, I was ready to throw it in the abyss. Justin Benson and Aaron Moorhead (also directors) play two brothers who return to the cult they fled from years ago to discover that, maybe, their beliefs aren’t so far fetched these days. There are secrets within, but also a lot of boredom. 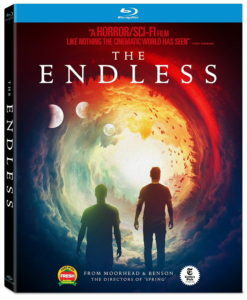 I had heard nothing but great things before watching THE ENDLESS. Currently, it’s sitting at 97 percent on Rotten Tomatoes. But it’s difficult to vibe with a film that has creative ideas that are overshadowed by inept direction. The film touches on deep themes, such as the drawback of free will and the bond between brothers, but it becomes so fascinated with its themes that it forgets we need to have an emotional connection with the characters. Extras: An audio commentary, a making of, behind the scenes, deleted scenes, visual effects breakdown, trailers and more.